Robert Gordon University (RGU) has appointed a studio manager to oversee the running of digital fabrication studio MAKE Aberdeen. Ben Durack has taken on the role at the facility which is based on the city’s Belmont Street and supported by Aberdeen City Council, Creative Scotland and the UK Government Super Connected Cities programme. RGU took over the running of MAKE in 2015. A product design engineering graduate of Loughborough University and Glasgow School of Art, Ben is excited to build a thriving, creative space in the heart of the Granite City. He previously worked with Glagsow-based product design engineering company Fearsome. The main goal of the studio is to make high end digital design, digital making and digital experience accessible to anyone who wants to make their ideas a reality, with members of the public able to utilise the facility for their creative work. The university is also keen to collaborate with north-east businesses and organisations through MAKE, with facilities on offer including cutting edge metal 3D printing, rapid prototyping and laser cutting equipment. Ben said: “I’m delighted to be helping head up MAKE Aberdeen which is a really exciting space with the potential to be something very special. “The whole focus of the studio is to be an incubator for people’s ideas. The technology is accessible and people can now get a production ready design in a fraction of the time and for a fraction of the cost. You don’t even need design teams any more – you can take it on yourself. A few years ago this was unthinkable. He added: “I want to get people excited about the potential of the studio. It has all the equipment that you would ever need to test out an idea or even to start a small business. There are a couple of other fantastic pieces of equipment coming soon which will make it even more exciting, including a metal 3D printer – that will mean MAKE is one of only a few places in Scotland to have one and it again widens the scope for what can be produced here. Ben also believes that working with the community by hosting a variety of workshops is key to creating a well-used, creative hub. MAKE Aberdeen has already been organising and running a wide range of events at the facility including a pilot project working with youth groups from Aberdeen schools to develop a series of pop-up Maker-Spaces for 11-16 year olds. It is also offering school-wide memberships to secondary schools in Aberdeen City at a special educational rate, thereafter resulting in pupils being able to become members for £1 and gaining access to all facilities at MAKE. Tailored classes and workshops are available and it is a model that is being developed and rolled out in consultation with teachers and head teachers. The team has also worked with a local charity to help older people with the use of modern technologies and has started a series of Creative CAD workshops involving pupils from various schools in Aberdeen and as far afield as Inverness. MAKE is holding two free introductory workshops to 3D printing on June 1 and 8 from 4pm to 8pm which are open to all. Places are limited so booking is recommended. 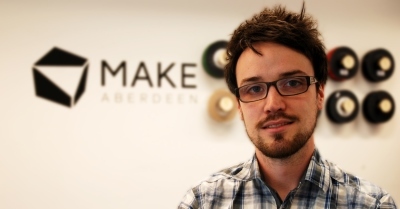 To find out more, phone MAKE Aberdeen on (01224) 644885 or email info@make-aberdeen.com. Opening hours are Tuesday, 10am – 5pm; Wednesday, 1pm – 8pm; and Thurs to Saturday, 10am – 5pm. You can keep up to date with all events and workshops by liking MAKE on Facebook and following the studio on Twitter.